This page provides an overview of the A' Design Award trophy which is given to the A' Design Award laureates during the La Notte Premio A' - The A' Design Award Gala-Night & Award Ceremony. The A’ Design Award Trophy is a gift given to the award winning designers who participate in the competition via professional entry method, the design award trophy is distributed for free of charge to all award winning designers and jury members who attend the A’ Design Awards’ Gala-Night. Award winners who cannot have the opportunity to attend the award ceremony, could request a delivery of their winner kits which also include the trophies. 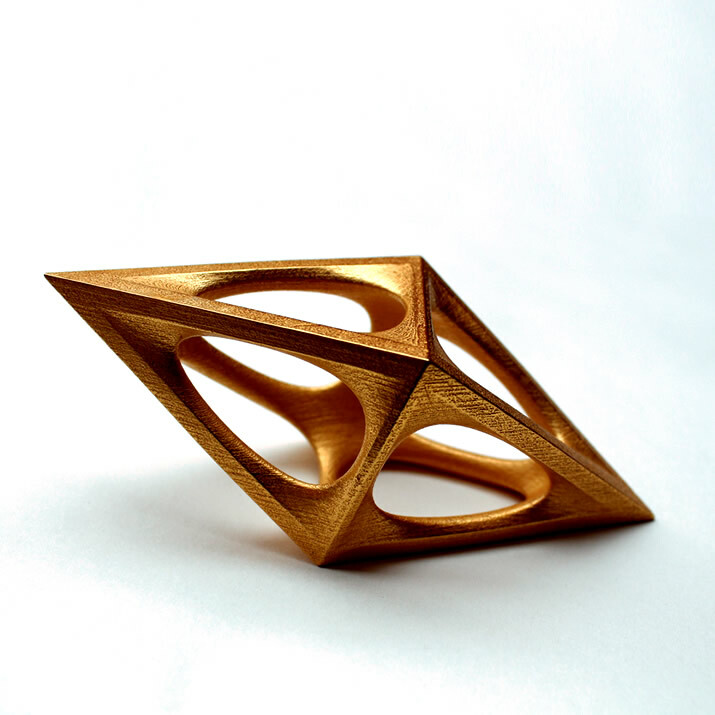 A' Design Award features a unique award trophy, that is realized by 3D metal printing since it cannot be perfectly manufactured with any of the traditional methods. The trophy is made in stainless steel and is gold, nickel or bronze plated depending on the award level. It was especially made as an impossible shape for conventional technologies, to underline the advancement and possibilities within the design field. Furthermore, this also makes A' Design Award trophy harder to duplicate or replicate. A' Design Award exhibit prototype design award trophies that is made in glass, plastic, ceramic and other materials, together with trophy samples from tests to duplicate the trophy using other production methods such as cnc at the annual design exhibition. 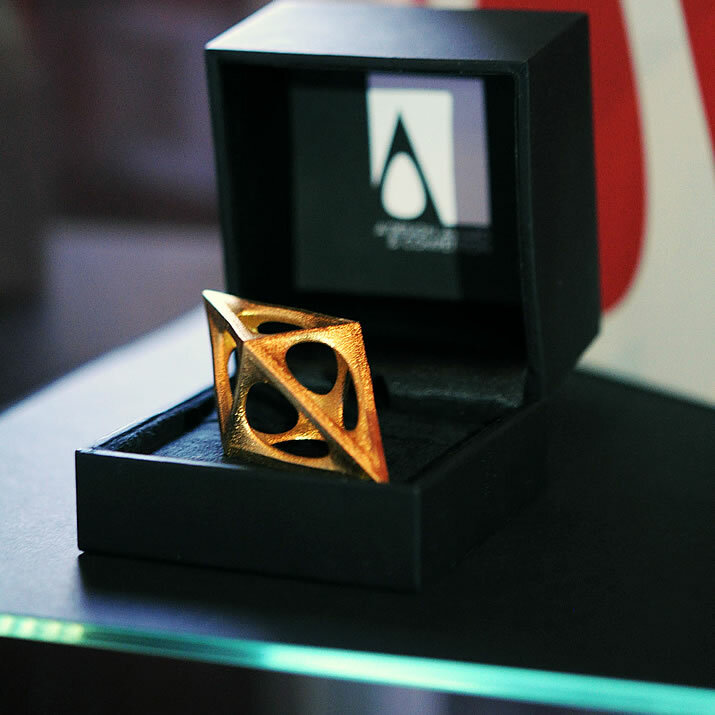 The award trophy is presented in a special black box, with A' Design Award logo. 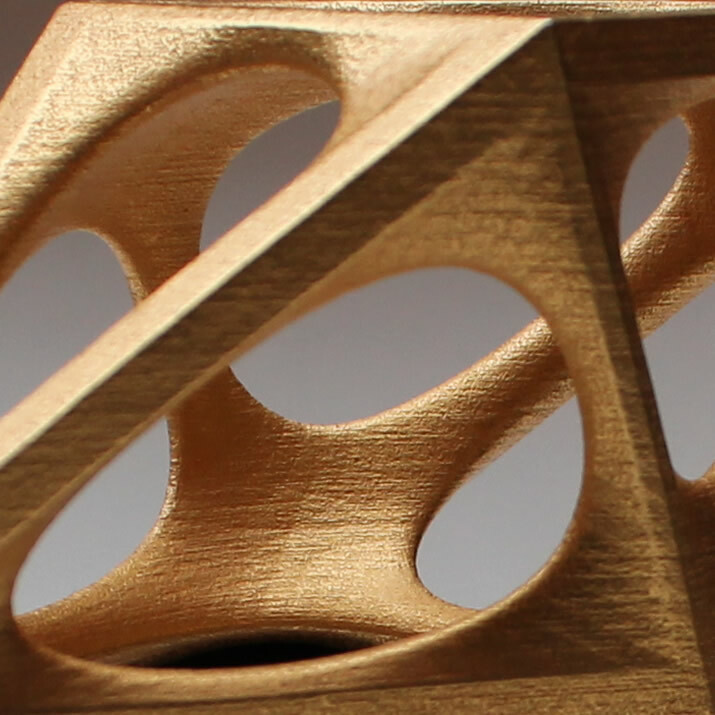 The design of the award trophy features both sharp edges and organic inner form. The sharper edges, which are outside, signifies the engineering part of any design work; i.e. indepth, precision thinking with solid details at the end of the design work. While the soft, organic interior signifies the fuzzy logic of design process; endless possibilites, creativity and imagination. The endless creativity and imagination is locked within the constraints and details, creating the final shape. The design of the trophy is also a play on the letter A. The award trophy features a hollow center with 8 windows pointing to all quadrants in the space, signifiying the universal aspect of design. Furthermore, the A' Design Award trophy has a perfect balance, several trophies could be stacked on top of eachother to make a sculpture. The award trophy is small in size, and is designed like a piece of jewellry. The award trophy is intended as a memento, and a luck item which people could carry with themselves. A' Design Award winners display their trophies in closed vetrinas, at their offices, place them on their desks, carry it in their pockets, or wear them as a piece of jewelry. 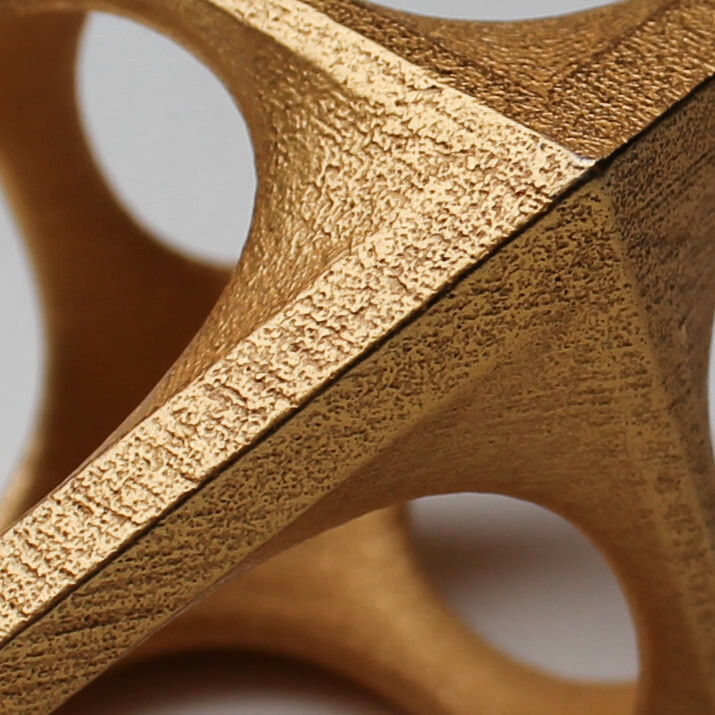 The A' Design Award Trophy, inspires and pushes designers to exceed their selves. The A’ Design Award Trophy is distributed for free to all award winning designers who participate through professional entry method, and jury members during the A’ Design Awards’ Gala-Night. The A’ Design Award Winners’ Trophy was designed by OMC Design Studios / Italy. The A’ Design Award Winners’ Trophy, called the Omega Particle was designed by OMC Design Studios / Italy. 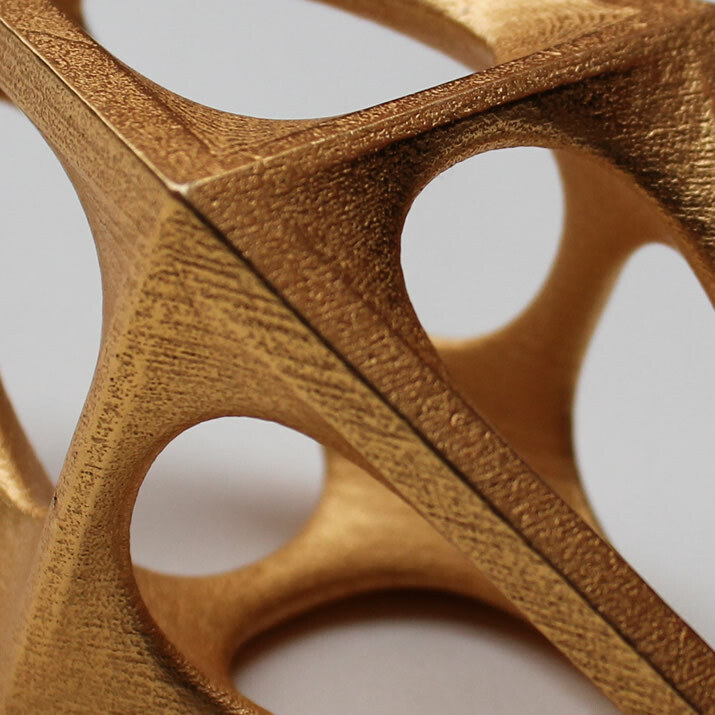 The Trophy represent infinite possibilities of a design process. The Omega Particle award trophy, given to extraordinary designers, artists and architects features sharp geometric edges for its exterior and soft organic curves for its interior. The contrast and union of sharp and soft edges, geometric exterior and organic interior signifies and reminds us the depth of design process which must bring together logic and emotions, knowledge and exploration. The trophy is balanced and the gravity center is at its perfect center to underline the importance of balance. 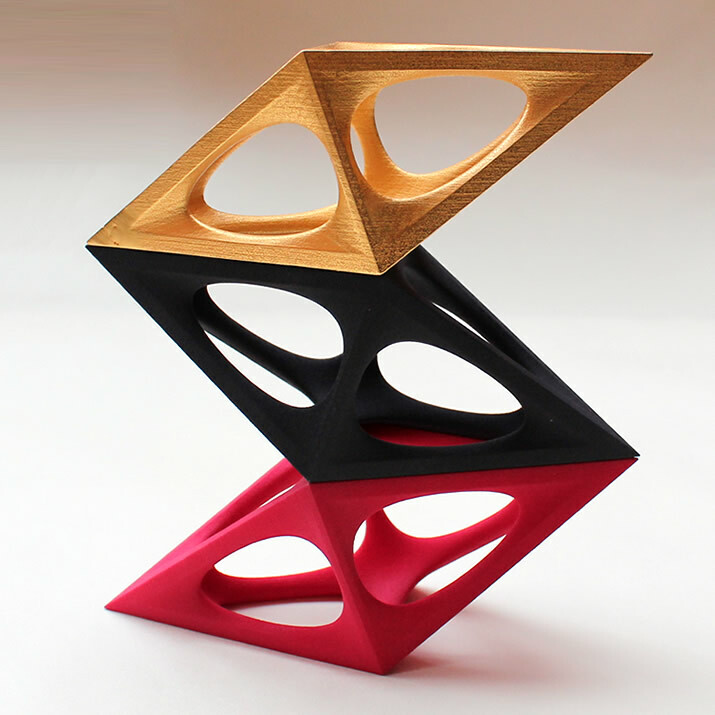 since the A' Design Award trophy is balanced, many of them could be stacked or brought together to create a larger trophy. When eight of the trophies are put together a shape that resemble the Sun is created. The Sun shape spotlights the fact that designers must illuminate with their work, creating warm feelings and joy for those who interact with their products. The number eight represents creation, building, perfection, wealth and luck in diverse cultures and has deep meaning in almost each religion as well as numerology. The combination of eight trophies create an octagonal star, an octagram that resemble the symbols of Dharmacakra, Selburose, Guñelve, Auseklis, Rub el Hizb, al-Quds star, Cross of Quetzalcoatl, Star of Lakshmi, Chaos Star, Star_of_Astaroth, Seal of Melchizedek, Star of Isis, Star Disc of Ishtar and others. Eight pointed stars and eight-spoked wheels are also used in ancient magical rituals as well as alchemy, in this context the Omega Particle reminds us the role of the designer as a modern alchemist who has capability to turn mere ideas into reality, to reinforce this meaning the trophy is 3D printed in metal, indeed it was the first ever design award trophy to be 3D printed in metal. From an isometric top view the Award trophy becomes a perfect square, with symbolic means such as planning, devising, hearth as well as material. Inside the square, a circle form is also seen together with a cross, which is similar to sacred circle, sun wheel, quartered circle or ring cross. The circle has a meaning of perfection, wholeness, focus and awareness. Blending of geometric shapes used in the award trophy is a reference to the alchemy, and role of designer as a modern alchemist. The award trophy itself has eight edges, faces and sides, made of triangles. Triangle symbol has meanings such as ascension, manifestation, illumination and integration attached to it, and three is considered the birth of wisdom. 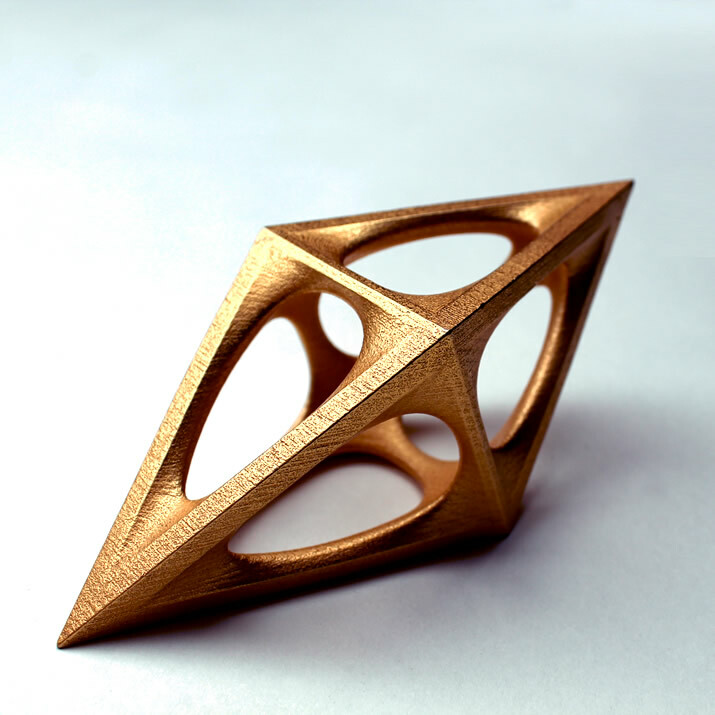 The A' Design Award trophy, from isometric side view has two triangles; upside triangle and downside triangle which together communicates the idea of balance, duality and unity once more. The double pyramid shape of the trophy thus brings together core perfect geometric forms of square, triangle and circle, and the overall form is a double pyramid i.e. a bipyramid, an octahedron, and a dipyramid. The trophy was designed to bring luck and inspiration, to be carried as a trinket for ideas, creativity and wisdom. 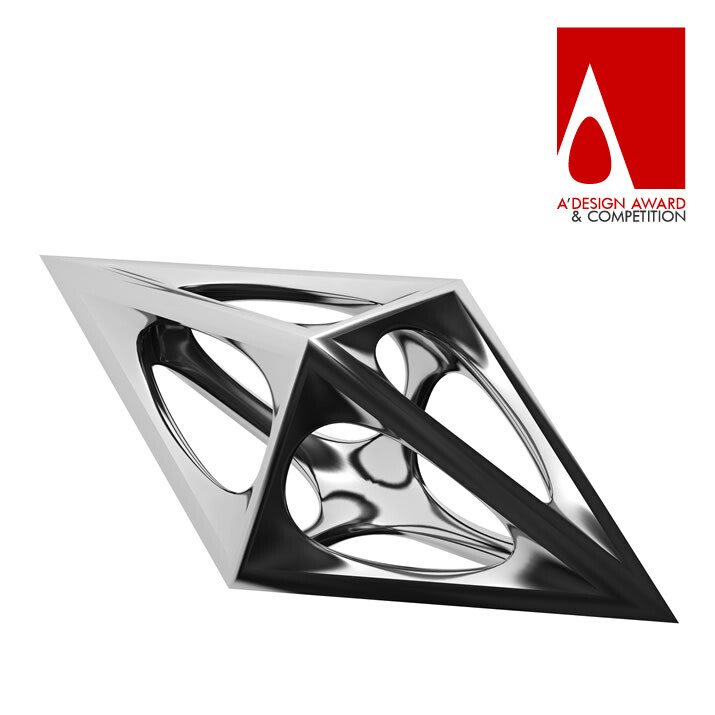 The Omega Particle Trophy has especially been designed for the A' Design Awards, and is a unique aspect of the A' Design Accolades. The upper half of the trophy has the form of letter A in its archaic simplified form. The latter A indicates the state of being first, better or superior. 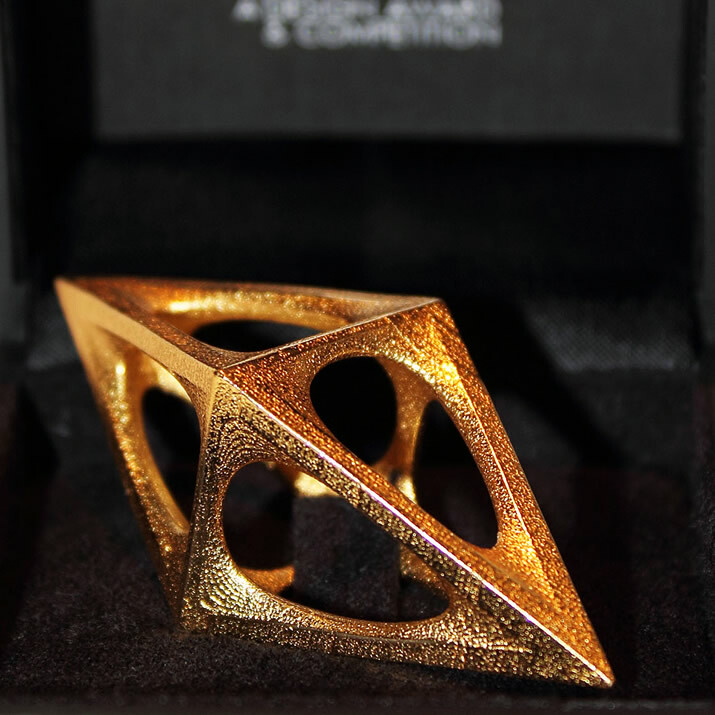 The A' Design Award trophy, the "Omega Particle" is not sold anywhere; it is especially designed for the A' Design Competition, produced in Europe by 3D Printing. It is amazing but true that, many other design award trophies of other design competitions and contests are available for sale and you could order the trophies of most other design awards from outsourcing platforms or trophy retailer websites. Furthermore, the original Omega Particle trophy is not for sale; we do not ask award winners to pay for the trophy, we give one free trophy to each design award winner, as compliments and as a means to thank the A' Design Award winners for contributing to advancement of the world through good design. A' Design Award trophy was designed as a jewelry that could be carried proudly by the designers, as a trinket for luck and creativity, thus we present it in a luxury jewelry box. Yet however big brands, famous designers, architecture studios and large agencies consistently requested XXL versions of the trophy to demonstrate to their clients or to add to their trophy walls. The XXL Design Award Trophy is optional and could only be ordered before the gala-night only. The XXL Trophy is also 3D printed in metal using stainless steel as base material which is later electroplated by gold, silver/nickel, bronze or other colors based on the award status. Bounding box for Regular Trophy 1.7 w x 1.9 d x 4.3 h enclosed in a box of 7 w x 6.5 d x 6h and the XXL Trophy has the following dimensions 5.6 w x 5.0 d x 13.0 h (all measures in CM). More trophy images are available here. 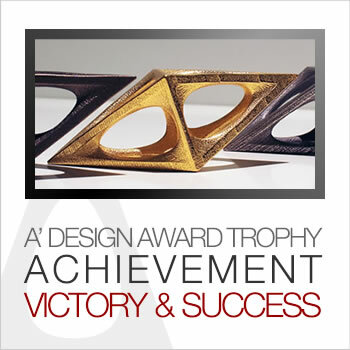 The A' Design Trophy is given to all who win the A' Design Awards, the trophy is included in the A' Design Prize and is distributed during the gala-night without any fees or request for preorders, it is given free of charge as a gift to remind the success of winning the design accolades. Award winners who cannot join the gala night could have their trophies shipped to their addresses by ordering the delivery of their design award kit. Award winners can click here to arrange delivery or request an XXL version. 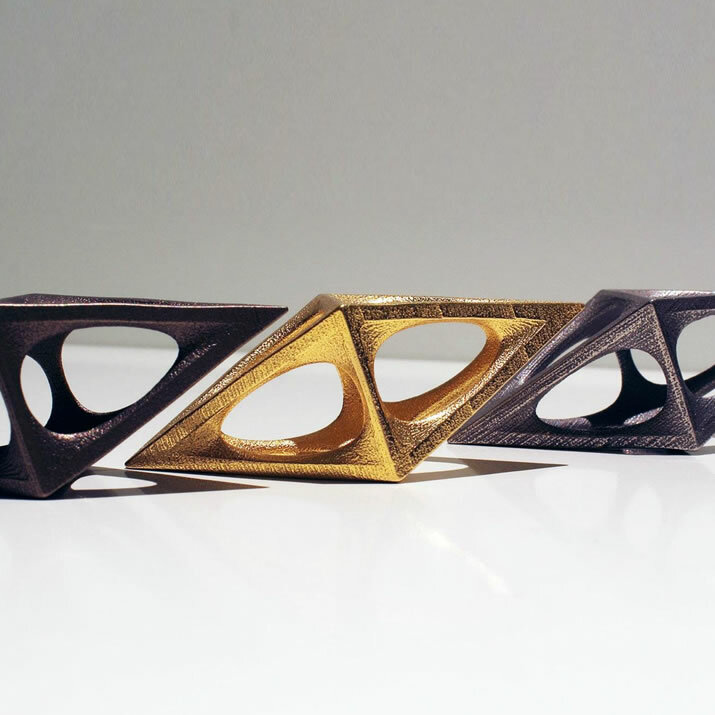 The A' Design Award trophy comes in several colors: gold plated, nickel plated, bronze, steel gray. Platinum award winners and gold design award winners both get the gold colored trophy, silver award winners are given nickel plated or polished stainless store trophy, the Bronze award trophy winners get a bronze colored trophy, iron or the regular A' Design Award winners get stainless steel trophy, all trophies are in metal. See colors and different trophy sizes here. The A' Design Award Laureates get the Omega Particle, an amazingly beautiful design award trophy that represents infinite creativity in addition to the life-time license to use the Design Award Winner Logo.